Supergirl by Stanley "Artgerm" Lau! Individually numbered limited edition statue of Kara Zor-El. 12 1/2-inches tall, she features a fan-favorite more casual take on her costume. Supergirl goes casual! Supergirl by Stanley Lau - It doesn't get any better than that! 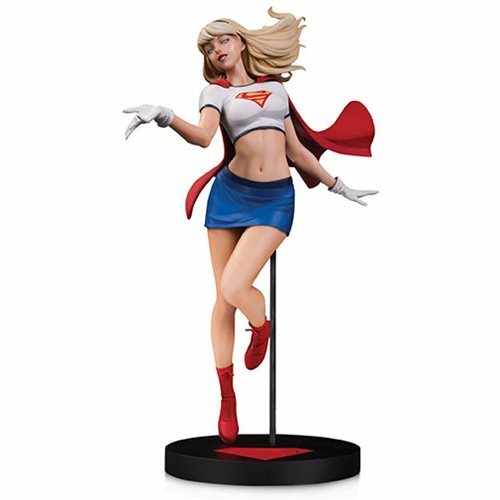 Based on a piece from renowned artist Stanley "Artgerm" Lau and sculpted by James Marsano, this 12 1/2-inch tall statue features Supergirl dressed in a fan-favorite alternate and more casual take on her costume. Her traditional armor-clad blue top and red skirt are replaced with a white crop-top and a blue skirt. Carefully detailed in polyresin to match Lau's beloved image of Kara Zor-El, the piece captures the joyful and heroic elements of the character, perfect for any Supergirl fan. The DC Designer Series Supergirl by Stanley Lau Statue is a limited edition of 5,000 pieces that comes individually numbered.